Rick’s state of the art computerized video system accelerates the learning process. Seeing is believing. The golf swing can be displayed in real time, slow motion, frame by frame with graphics, split screen with tour player comparison and more. Problem areas are identified quickly and a plan is formed to create a more consistent, fundamentally sound swing through gradual adjustment and repetition. 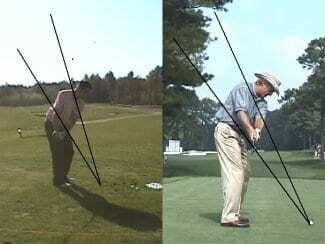 SWING KEY: Video analysis demonstrates a student casting on downswing instead of holding the cocked position longer as demonstrated by a tour player. SWING KEY: Using tour player, Greg Norman “The Shark”, demonstrates how club should remain on plane on takeaway not pulled to the inside. 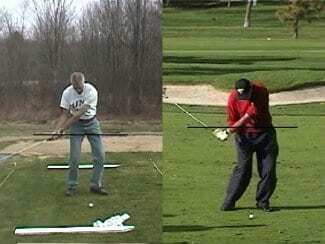 SWING KEY: Video analysis demonstrates a student with flying elbow. Tour player shows a more connected swing. 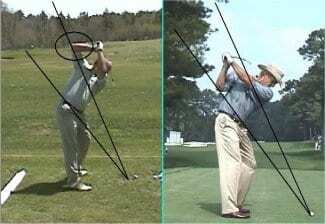 SWING KEY: (click on image for enlarged view) Video demonstrates excessive head movement. Student needs to maintain his spin angle from address to impact along with more consistent flex in the knees Once this is established we would move on to step 3.